My favorite rag balls. They are silk and the most incredible color. I am saving these for just the right project. 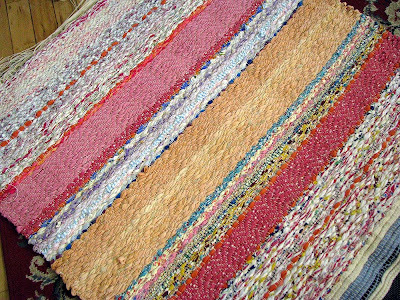 Sweet vintage fabrics used in the last rug of the three. 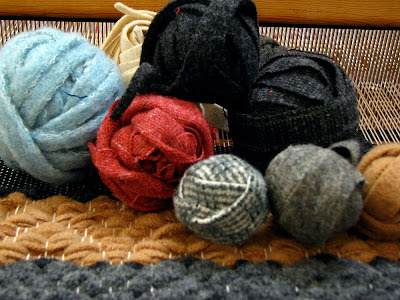 Fun to think of the childrens dresses or shirts that these are from, and the weaver who painstakingly prepared the rags into these balls. So not my favorite part, so I always look for rag balls at flea markets or antique stores. 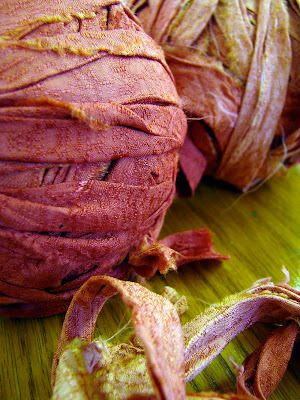 The ball on the lower left is a sheet I dyed using left over dyes from a kids t-shirt dyeing party. 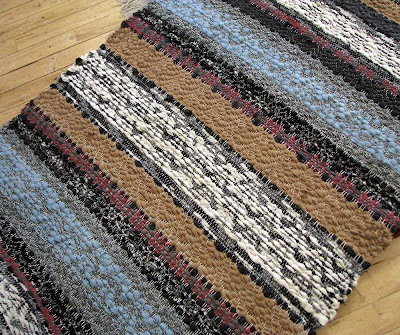 The wool rug is my favorite and so squishy underfoot that my middle daughter thinks it should just stay at our house. Since it looks like it belongs in a log cabin (which we have); maybe it should. 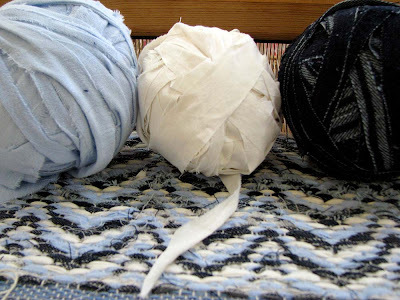 Hard to believe all three of these rugs were on the same warp. 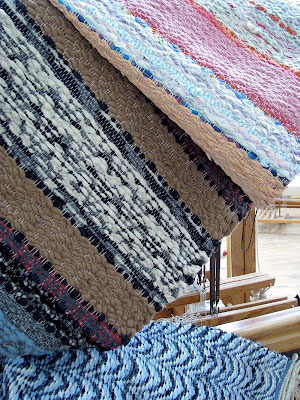 The draft for these rugs was inspired by elsa eriika on her incredible blog textile experiences. 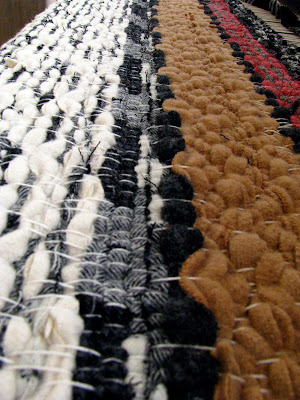 These rugs were a long time in the making. Started in late summer, they were put on hold too many times when life got in the way. It was such a joy to finally unwind them from the beam and renew my acquaintance was the first rug that I hadn’t seen in a few months. I’m so glad that I didn’t get too impatient and just cut off that last bit of warp from the loom. The little haphazard pink rug using up odds and ends, just makes me smile. 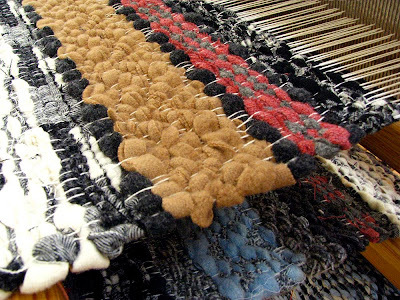 Lesson to Barb… just keep weaving; and no more hacking off of warps just cause they are making you mad. When I walked out of the studio with the rugs rolled up and under my arm, I felt like strutting down main street just to show them off. However unless one of my weaving buddies saw me; most everyone else probably wouldn’t have given the crazy lady lugging rugs under her arm, another thought. 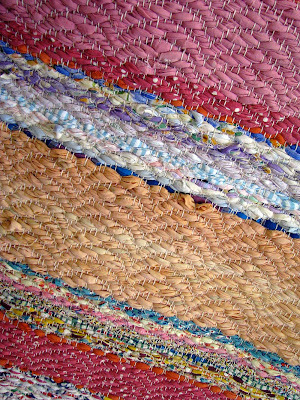 Gorgeous rugs! 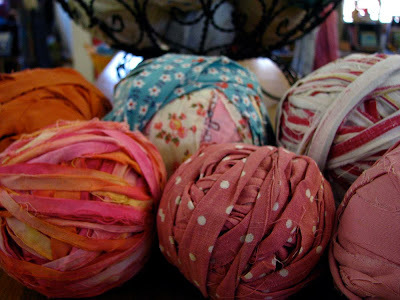 And I never would have thought that you could find rag balls at flea markets and antique shops, how cool. 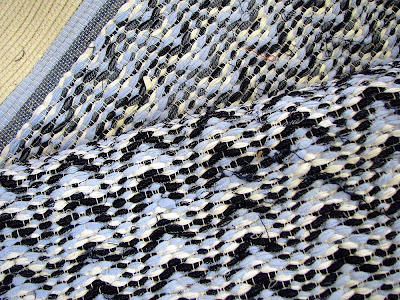 Thanks, pulling things off the loom is still magical, and congrats on your wonderful handwoven articles. I found a couple rag balls at an antique sale. These rugs look like such a pleasure to walk on.